Today is St. Lucia Day, a Scandinavian Christmas/winter solsticey celebration of the light returning to Scandinavia (before the switch to the Gregorian calendar, apparently St. Lucia Day fell on Winter Solstice). My mother's family did it, I did it growing up, and now my own family does it every December 13th; I love preserving that chain. Traditionally the oldest daughter in the family (my two daughters take turns and I help them get everything ready) gets up before dawn and prepares breakfast in bed for the family. 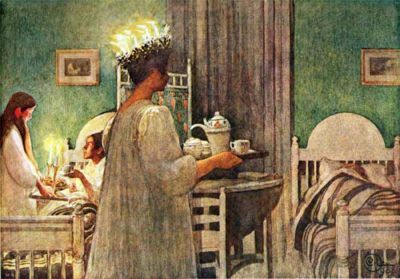 Wearing a crown of candles, she goes from bed to bed, singing "Santa Lucia" and giving pastries and hot chocolate. It's one of our favorite traditions, pretty much a non-negotiable part of our Christmas season. We don't have the girls wear the candle crowns anymore; they carry a wreath of candles on a tray. (Although, growing up I would find candle wax in my hair and scalp all day after the candle crown dripped on me on St. Lucia morning.) Now there are new-fangled battery operated St. Lucia crowns. Not as authentic or exciting but a little safer, I suppose. Tagged with M, family, holiday, traditions.